In the early hours of Monday 4 November 1957 Hatfield was subjected to a night of terror. 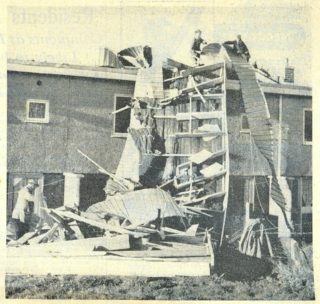 The roofs of houses were sliced off as if they were pieces of cheese and sailed through the air in gale force winds of 80mph. 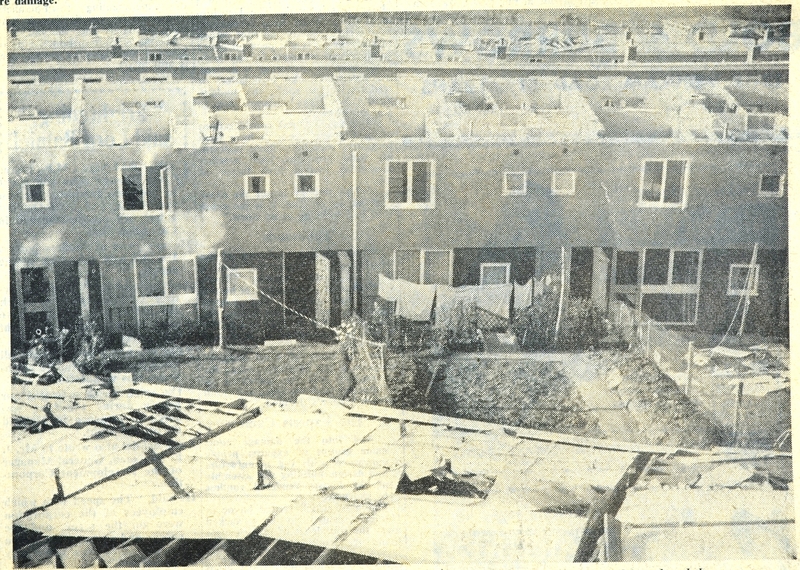 The airborne roofs of houses were hitting blocks of flats in Robins Way, causing the plate glass windows to explode on impact. Some of the houses seemed to be reduced to strips of twisted board and metal. 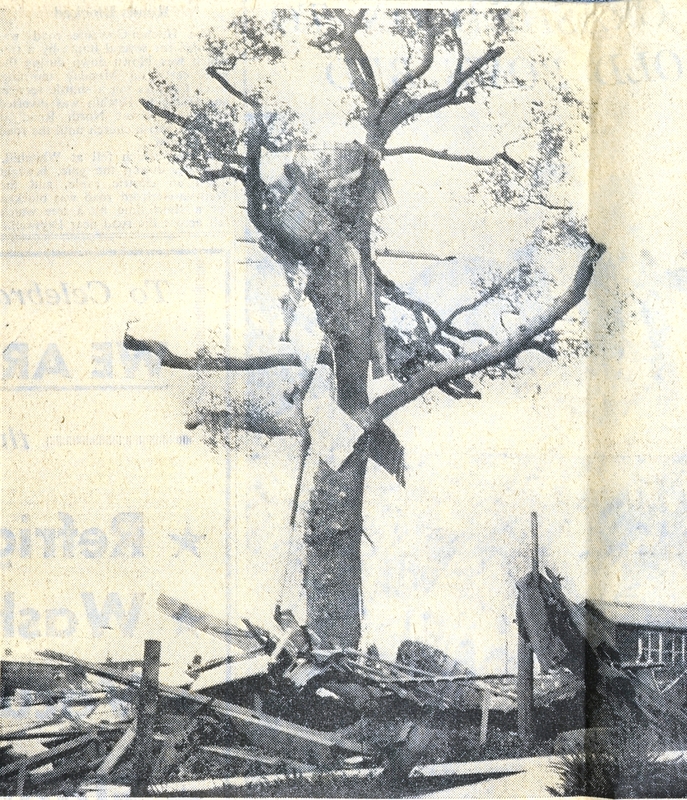 A roof was even wrapped around a tree. One house had water cascading through the ceiling. The roof was off; water flooded the upstairs rooms and in the sitting room soft furnishings were bedraggled and ruined. People were told to turn off the electricity from the mains, which left them groping about in the dark, until the street lights could be turned on again for the emergancy. As you can see from the photos devastation reigned in Hatfield. 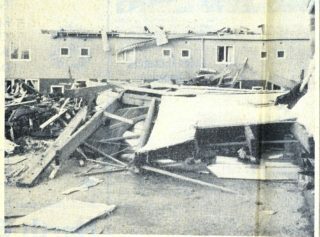 About 50 houses were affected and 26 roofs were completely off. Operation storm path went into operation and by night fall 24 homeless families had moved into empty corporation houses in Hatfield and Welwyn Garden City. Mrs Swallow of the County Civil Defence Welfare Office, was placed in charge of emergancy feeding. Preparations were made to sleep 150 in Cavendish Hall that night, but offers of private hospitality flooded in; no beds were needed. 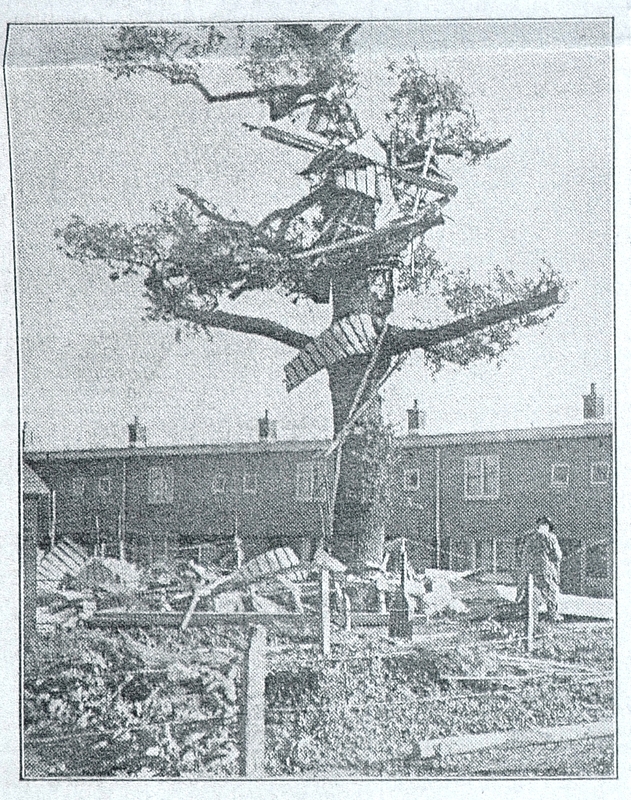 At daybreak it looked as though an H-bomb had hit the terraces of houses built like the tiers of a wedding cake on the slope of a hill overlooking the Barnet-by-pass. After a night in strange surroundings, some of the displaced families returned to their ravaged homes. In Robins Way, a woman tucked a doormat under her arm. Another bent down among the wreckage in her back garden to gather flowers peeping from a chimney pot. A three year old evacuated with her parents, returned red eyed after a sleepless night to find her lost Teddy Bear. He was salvaged from the devastation minus one ear, but a joyful reunion had. Upper rooms of houses gaped to the sky, spirals of metal sprang from broken houses, amazingly ten complete rooftops lay in a row across a lawn. Through out the Hatfield New Town area there was a feeling of relief that the major damage was to the houses and not to the persons living there. 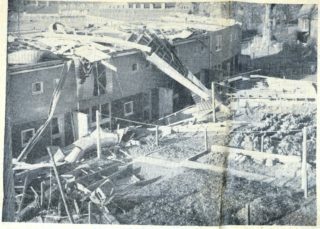 I was 5 weeks old and lived at No 1 Shallcross Crescent when this happened. It’s the house on the corner with the phone box at the side. I remember my mum showing me pictures of the damage to houses round us when I was a child. We were lucky as there was no damage to our house. It was the day after my sister’s 2nd birthday (Ena). We left Hatfield and moved to Boreham Wood in 1962 and then on to Wigan after my father left us in 1964. 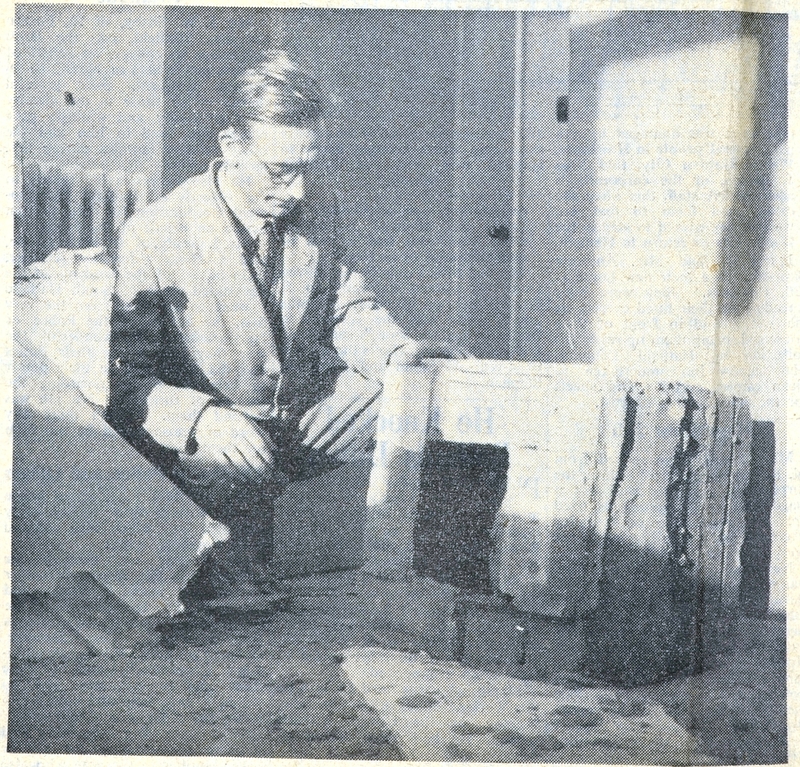 We lived at No.23 Shallcross Crescent when this occurred. Fortunately, our house-front faced east and its roof stayed in place. The damage occurred mostly to the west-facing houses. I was 5 years old at the time and yet still clearly remember the screaming noise of the wind and the banging and clattering that went on. In those days, the street lighting was automatically switched off at midnight, so all this took place in pitch darkness in the early hours. In the morning when daylight came, I still remember the words of my father as he looked across the road at the houses opposite “I don’t know – there’s something funny about the houses across the street…. Christ, there’s no bloody roofs on them!” And so it was – you could see daylight through the upstairs windows all along the street. Altogether, over 50 houses were affected and lost their roofs. In those days hardly anyone had a telephone in the house; there was a long queue of people outside the callbox at the end of the street, waiting to phone the council. 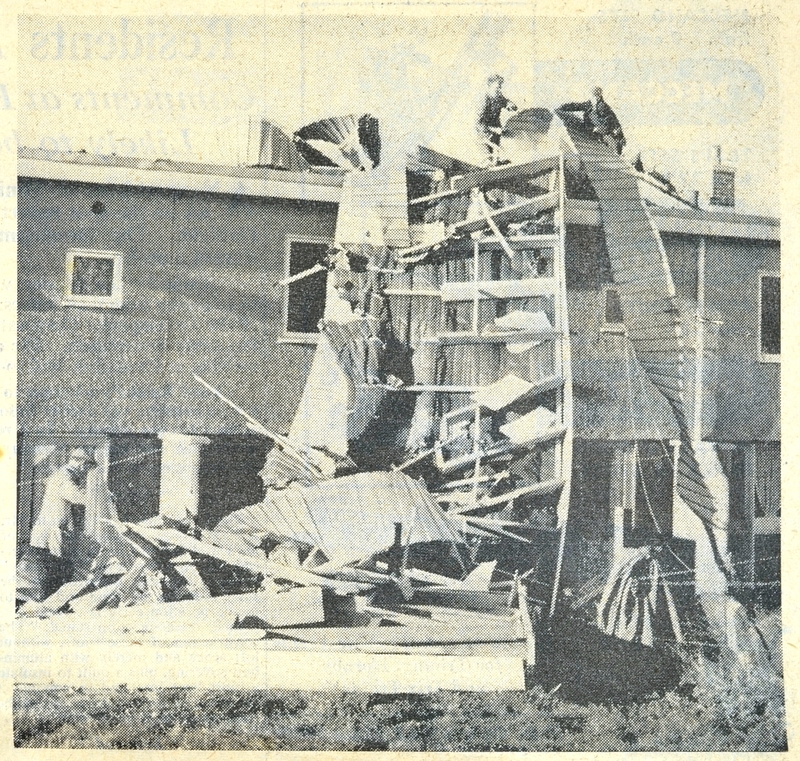 Amazingly, there were no fatalities and, as far as is known, not even any injuries – quite remarkable when you consider that great sheets of aluminium must have been flying around during the night – could have had your head off in no time. The subsequent investigation and public enquiry found that in some cases the roofs had not been adequately fixed to the house walls. In the months that followed, repairs were made and structural improvements involving additional strong steel fixing brackets were installed. 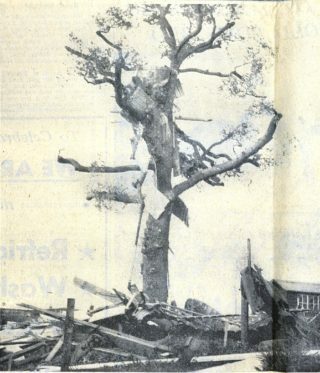 I continued to live in the house until 1973 and there was never any further storm damage during that time. But to this day I still get jittery during gales. My mum was just talking about this the other day so I thought I would see if there was anything on this wonderful web site. I was only 1yr 10 mths and in my cot that ended up with me under lots of blankets that had blown over my head but not injured , my mum was laying in bed awake said to my late father Ron I have just seen the roof lift. ”Dont be daft” he said then with in minutes, off it flew into the back gardens, What a shock we all had well not me I was to young, it was a cold night and mum asked my father to put the fire on as she was freezing “dont be silly” he said it might be some thing to do with the fact we have no roof , she still has the cuttings from the newspaper when it happened wow 56 years ago showing my age now !. They went to Welwyn Garden City , but I came back to live in Willow Way after about a year its great hearing memories from mum Mrs Joan Wigens ………. I remember this, not because I was living in one of the houses, but because my best friend’s father was the Chief Estates Officer for the area, (they lived in a beautiful big house called Galleycroft which was eventually demolished to build the swimming pool). He was called out in the early hours of the morning to deal with the disaster – it was completely unheard of that buildings would be damaged in this way just because of the heavy winds. 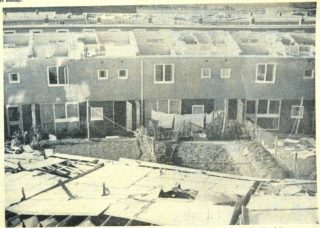 It was only these kind of row houses with flat angled roofs that were affected – all of us in regular style houses were unaffected.